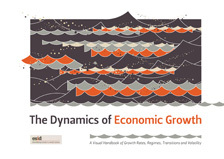 ESID is pleased to announce the publication of ‘The Dynamics of Economic Growth: A Visual Handbook of Growth Rates, Regimes, Transitions and Volatility’ (PDF, 18.80MB) by Sabyasachi Kar, Lant Pritchett, Selim Raihan and Kunal Sen. The Handbook presents graphs to illustrate the dynamics of the growth experiences of 125 countries. These graphs highlight the dynamic and episodic nature of economic growth and show that many countries have experienced very different growth phases. The timing and magnitude of ‘breaks’ or ‘episodes’ or ‘regime transitions’ for all 125 countries are identified using a standard statistical procedure. This view of economic growth as transitions across growth phases suggests the need to move beyond current approaches to studying growth. To understand what determines economic growth, a ‘third generation’ of theoretical models and empirical methods needs to be developed.